Are you tired of personal training clients “no-showing”? Gamify your workouts in a group environment...YES! It is possible to work out AND have fun! 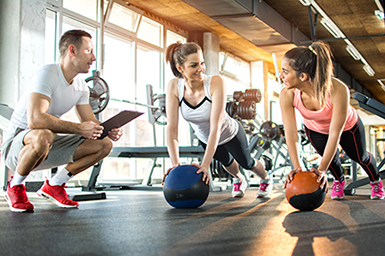 How, as a personal trainer, can you aim to motivate clients and make sessions as varied and interesting as possible? First, identifying a client’s preferred "movement style" using the PTA Global "PDQ" (Program Design Questionnaire) can mean the difference between enjoying a training session or just enduring it. Here is another win: If they enjoy their time with you, they are more likely to come back for more! On a personal level, I work to gamify various elements of workouts wherever possible. Incorporating fun games and/or little challenges into each session never fails to put a smile on your clients’ faces. These adaptations can leave them in a healthier emotional state, as well, by lowering stress levels and creating visibly positive changes in demeanor and posture by the end of the session. Many of us have such a variety of different exercise environments and equipment available to us. This alone, can keep your sessions fun and varied by utilizing the different tools and technology available. Here are some video clip ideas of different ways you can make your workouts more creative, unpredictable and fun, while still achieving purposeful results. If you’re fortunate enough to have access to an Outdoor Fitness environment, this can benefit your clients by improving mood and aiding in the reduction of depression. Outdoor exercise provides a mental health boost beyond that of just remaining indoors. Incorporating play and/or game-based exercise can be one of the most beneficial ways of engaging and building a deeper connection with your clients. I have worked with many personal trainers over the years, and the common theme with the most successful of them is not necessarily having the best technical knowledge. Instead, the real strength lies in their ability to connect with people and build a friendship or bond with their clients on a deeper level. Incorporating games, play and laughter can create stress relief and serve as a distraction from the exercise itself. In my experience, it can also provide an opportunity to fast-track the interaction and connection building between you and your clients. Heart-rate technology can be a great engagement tool and may reinforce the science behind the purpose of your workout. It provides tangible evidence when clients receive their statistics at the end of the workout. In addition, it can be rewarding to see they have achieved a calorie or energy-system/heart-rate zone goal. For some clients, giving them the power to control their own exercise selection (from a pre-prescribed list) can create more buy-in. They then become increasingly invested in the process. From a group training perspective, this can also stimulate group challenges. For example, in the ViPR video, you’ll see a team that created their own integrated flow of 4 separate exercises and attempted to match-up their rhythm and timing. Alastair Crew is a positive, trustworthy person who loves working in a team environment. As a Fitness Professional, he is passionate about empowering people with the skills to move well & feel better. He currently works as a Group Health & Fitness Support Manager at David Lloyd Clubs and has previously trained for Orange Theory. Alastair is excited about his new role introducing heart rate lead, interval group training to the UK in conjunction with Orange Theory Fitness & David Lloyd Leisure. He supports the Studio Manager with driving pre-open sales and ensures the OTF Personal Trainers are delivering all sessions to the highest standards.